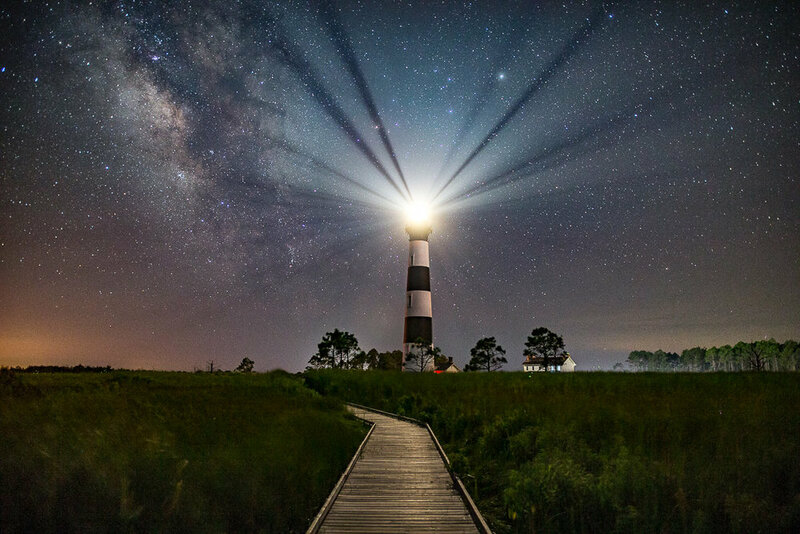 Treat yourself to a slice of photo heaven as you discover how to capture the splendor of the Milky Way galaxy and epic starscapes of the Outer Banks. Join me as we explore the breathtaking coastal night sky where light pollution is limited and the scenery is absolutely spectacular. You will learn to master the art of night sky photography and the concept of light-painting to add visual interest to your nightscapes. Additionally, we’ll spend time going over sunset and sunrise capture, as well as twilight capture. 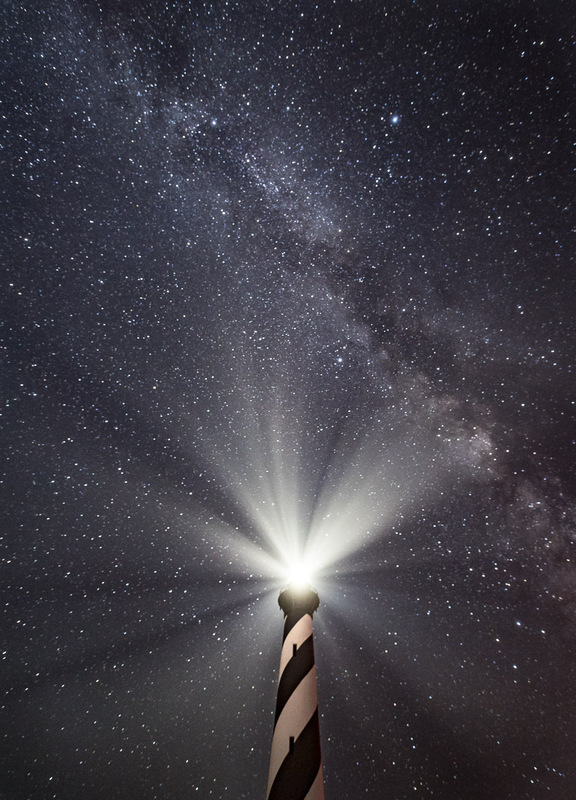 Nearly the entire eastern half of the United States suffers from light pollution that prevents people from being able to see many stars at all and certainly not the Milky Way Galaxy. 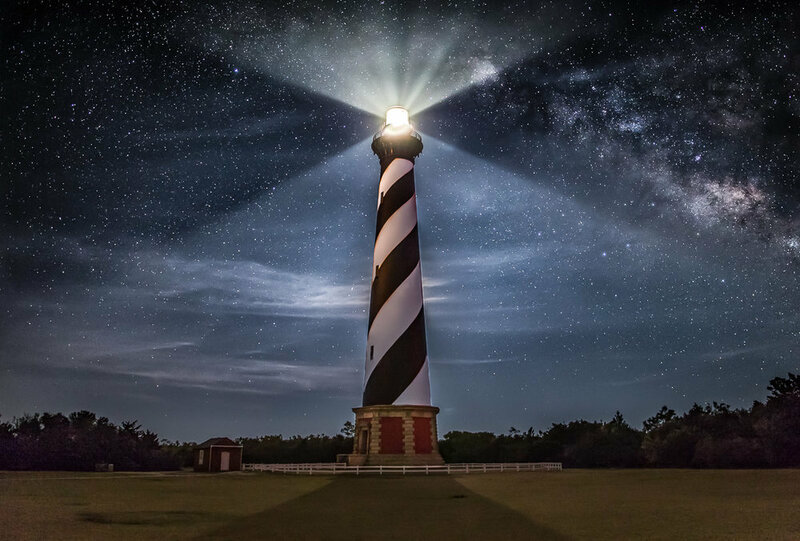 Due to limited light pollution, the Outer Banks of NC has some of the darkest night skies in the eastern United States and is an excellent place to photograph at night. The Milky Way is visible in the night sky all year long, however we see different parts of the Milky Way throughout the year. In the months of April through September, the Galactic Core (the most attractive portion of the milky way) is visible for at least a couple of hours each night (assuming that you have clear skies). It is also best to photograph stars around the new moon phase so that moonlight doesn’t wash out the stars. Because of all this, I offer most of my night photography workshops between April and September in the few days surrounding the new moon each month. In the Spring, the Milky Way is lower in the sky…giving it a more horizontal appearance in your images. In the Fall, the Milky Way is more directly overhead…giving it a vertical appearance. Additionally, in the Spring, the Galactic Core is visible in the hours preceding sunrise. Whereas, starting in the summer, the Galactic Core is visible right after sunset and throughout the entire night. In the Fall, the Galactic Core is visible only for a time right after sunset. Most of the trips will start in the evening of the first day with a sunset shoot. After Sunset, during blue hour, we will then go over what you need to do in order to photograph stars (that generally reach peak visibility about 1.5 hours after sunset). We will then continue photographing at a couple of different locations. There is some chance that we will stay out all night long (especially if the weather forecast for night 2 is poor). However, it is rare that we are out much later than 1-2 am. On the second night, we will meet in the late afternoon to grab dinner and have a night photo processing session before we begin our field session. It is rare that I’ve ever had a workshop washed out due to the weather. 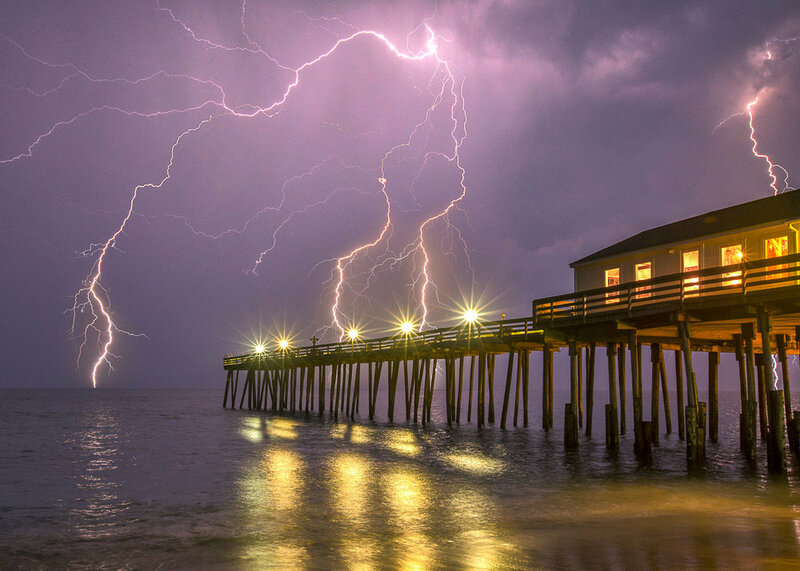 Even if we have clouds, there are plenty of attractive nighttime subjects to photograph. Quite frankly, I actually ofter prefer to have some clouds in my night sky images. It also make for some great shot of the lighthouse. Wide angle lens (24mm or wider) with aperture of at least 2.8 or larger (2.0, 1.8, 1.4). All transportation during the workshop period is provided. Discounted lodging has been secured or you may make your own lodging arrangements. I will provide you with lodging information upon registration.